Our ceiling tiles are a key component of our moisture-resistant basement finishing system. 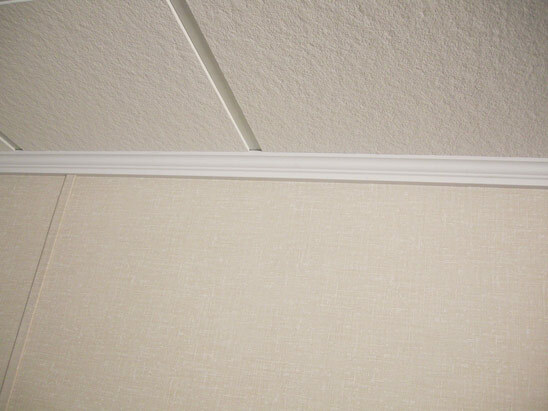 If you are looking for a solution for your basement ceiling, Total Basement Finishing's (TBF) ceiling tiles are made specifically for the unique conditions a finished basement presents. Created out of an inorganic mineral fiber composition instead of wood fibers, our 2' x 2' x 3/4"-thick basement ceiling tiles are water resistant and have a 30-year warranty against mold and mildew. This is the best system available to make your basement feel like home. For a Free Basement Remodeling Estimate with your local TBF dealer, call us or contact us online today! Our Linen Ceiling Tiles are our brightest, richest looking tiles. With an attractive, sophisticated look, their bright design helps to make your whole basement look larger, cleaner and well-lit! These tiles are ideal for brightening a family room, home office or home theater. The Prestige tile is a recessed ceiling tile that is specially textured to be forgiving of marks and dings. With its more economical pricing, it's a solid choice for a game room, children's play room, home gym, or creative space. The Prestige and Linen basement ceiling tiles are a perfect companion to the ThermalDry® basement floor tiles, EverLast™ insulated basement wall system, and basement window system to create a comfortable and attractive new room in your home! These four basement finishing systems make up the Total Basement Finishing solution. Total Basement Finishing's basement ceiling options are made specifically for the unique conditions a finished basement presents. Created out of mineral fiber, our 2' by 2' by 5/8" basement ceiling tiles are mold resistant and have a 30-year warranty against mold and mildew. This is the best system available to make your basement feel like home. TBF Drop Ceiling Tiles are the Best! With drop ceilings becoming more and more popular in recent years, they're a practical, stylish choice for a basement makeover! And though you may not realize it, your basement ceiling can affect your entire house. 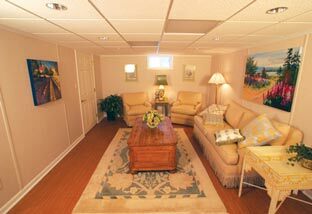 The type of basement ceiling you choose can affect how warm or cold the floor above your basement feels, how much noise travels from your basement to the rest of the house, and how well the ceiling repels moisture and mold, keeping it from spreading through your home. 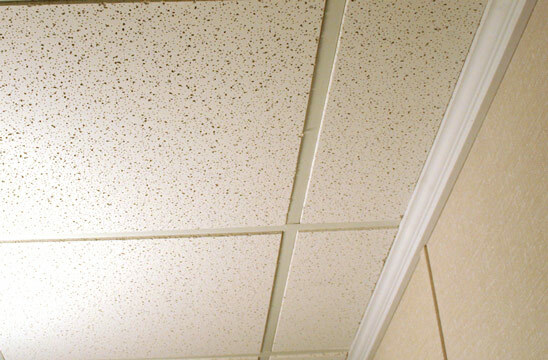 Our drop basement ceiling tiles are fully compatible with 2' by 2' fluorescent lighting and downlighting. They're firm, solid panels with a 30-year warranty against sagging and come lined with a solid white crown molding that give our tiles a sophisticated, finished look! Call or contact us online for a Free Basement Finishing Estimate with your local Total Basement Finishing dealer today!